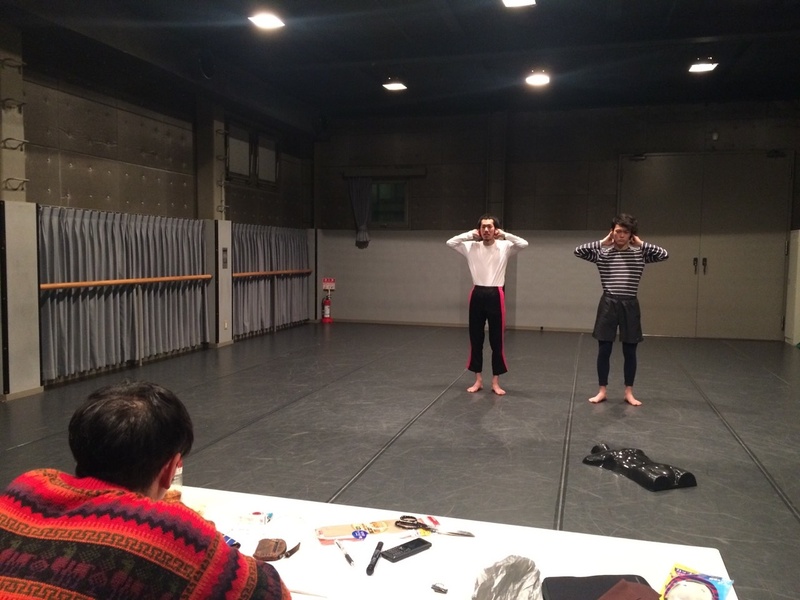 Back story: Yudai Kamisato (left) leads a rehearsal for "+51 Aviacíon, San Borja." The title of Yudai Kamisato’s new work “+51 Aviacíon, San Borja” references his grandmother’s address in Lima and the international telephone dialling code of Peru — but that only hints at the unusually cosmopolitan background of this 32-year-old Japanese playwright and director who also has relatives in Okinawa, Hokkaido and the United States. A resident, like his parents, of Kawasaki in Kanagawa Prefecture, Kamisato formed his Okazaki Geijutsuza theater company in neighboring Tokyo in 2003. With it, he soon built a formidable reputation for socially acerbic and sometimes absurdist works, and the troupe featured prominently from 2010-12 in Festival/Tokyo, Japan’s biggest annual arts event which, until recently, was known for showcasing cutting-edge works. 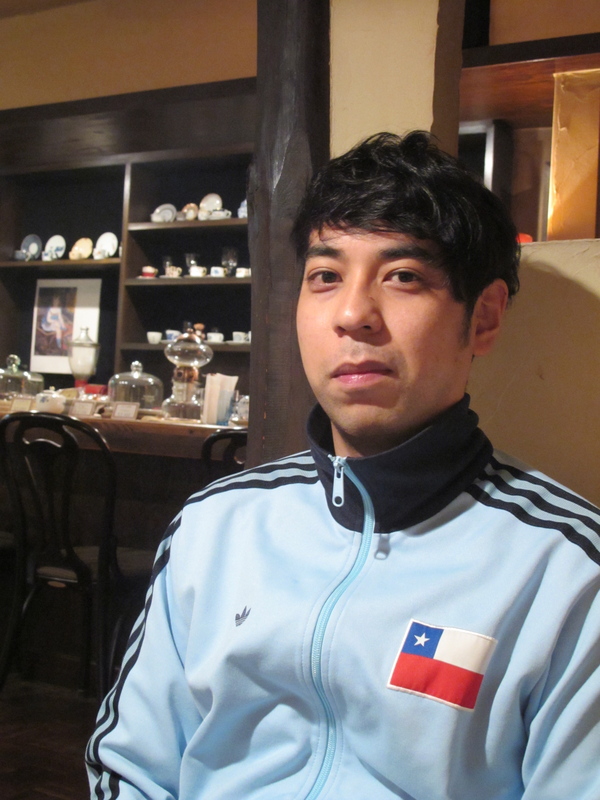 When we met last week in a cafe near his Tokyo rehearsal studio, Kamisato — perplexingly sporting a zip-up top featuring the flag of Chile — was soon wondering aloud: “How do people decide where they come from? 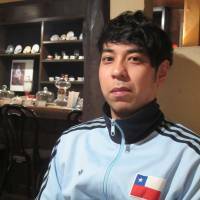 “For example,” he continued, “I was born in Peru, but my parents moved to Kawasaki when I was a baby. My mother is from Hokkaido and my father was born in Okinawa but his parents took him to Peru when he was about 7. He didn’t move to Kawasaki until he was 20 — though because of his work, I was brought up in Paraguay for few years. But Kamisato’s new play set to be staged at the TPAM festival in Yokohama isn’t just nostalgic reportage. Later we see I meeting characters portraying various people with Latin American connections, including Seki Sano (Masahiko Ono), a left-wing dramatist who was harassed by the police in 1930s Japan. As a result he fled first to Berlin, then Moscow, Paris and New York before settling in Mexico, where he became known as “the father of Mexican theater” before dying there in 1966. As well, the play features Ryoichi Jinnai (Mari Kodama), octogenarian founder of the major consumer-finance company Promise, who is known for his support of Japanese immigrants in South America. Throughout, he, Sano and I engage in conversations about their lives, theater and U.S. bases in Okinawa that cleverly serve to show Japanese as others might see them. Meanwhile, as we talked Kamisato noted how, when he went to a theater in Lima, “The people there were all rich and upper class. And though the dramatists thought of themselves as liberals, in fact they were just making plays for those privileged people. In his earnest effort to communicate directly to audiences without “bourgeois frills,” however, Kamisato has this time opted to have his play’s lines delivered simply from an uncluttered stage in a directorial style set out in “The Empty Space,” 1968’s seminal work by English theater titan Peter Brook. As the Japanese artist put it, “I’m not interested in making plays for a commercial circle in Japan or for fame in that cozy theater world. I think it’s important to never just go with the flow, but to occupy an alternative position like the role of the jesters who, in Shakespeare’s works, often critique the mainstream. However, Kamisato cautioned, “I may find myself in a difficult position, as far as creating theater is concerned, if I keep on ignoring the social mood, because all everyone seems interested in now is the 2020 Tokyo Olympics. 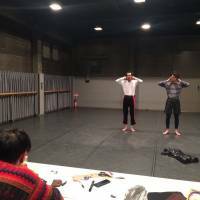 “+51 Aviacíon, San Borja” runs Feb. 13-20 at ST Spot in Yokohama. It then tours to Kagoshima and Kumamoto in Kyushu, then Kyoto, before a March 19-23 run at Nihonbashi Institute of Contemporary Arts in Tokyo. For details, call 03-6825-1223 or visit precog-jp.net or www.tpam.or.jp/2015.